Make it Daphne’s tonight—for breakfast, lunch, dinner or just dessert! Do you have trouble finding a restaurant that the whole family likes to eat at? 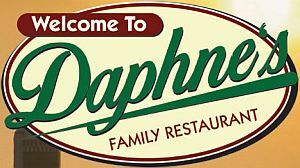 Don’t hassle with your picky eaters anymore; bring the entire gang to Daphne’s Family Restaurant for scrumptious food the whole family will love. We’re a family owned and operated eatery, offering the best in all meals for people in Lincoln, Illinois and the larger Central Illinois area. We’re a local favorite, and people love us because we serve high-quality food at prices that don’t break the bank. We love to serve you, and we know you’ll love our food—stop by for a bite today! We’re proud to serve the people of Lincoln and the surrounding areas with great food for them and their families. We’re a local gem that is a place where friends can talk over breakfast, and families can enjoy an evening together. We have an extensive menu that is sure to have something that everyone loves. Stop by for breakfast and have your choice of traditional favorites like Eggs Benedict, pancakes, and so much more. If you’re stopping in for lunch, you’re bound to be impressed by our list of classic appetizers and hearty meals that will satisfy your hunger. Our menu features everything from burgers and fries to gyros, chicken wings, steaks, salads, sandwiches, and more. Make us your first choice for breakfast, lunch, or dinner this week. We open our doors every day at 6 am for breakfast and close around 8 pm. Stop by in the morning and try our breakfast buffet where kids under 3 eat free. We can also offer a daily salad bar. We take care of our customers with healthy choice cold plate meals and even senior discounts. Let us put your hunger to rest! We’re the place to go for everything from American Classics to Mediterranean fare, and breakfast too! Visit us today, and we’re sure to make ourselves your new favorite restaurant!